The team at Rotor Riot has done it again, pulling together some phenomenal pilots to rip up a perfect location. This time around, UmmaGawd, Le Drib, and StingersSwarm are joined by NurkFPV and Phluxy FPV at the Big Thrill Factory in Minneapolis while in town for the 2nd Annual Drone Video Awards. The focus? 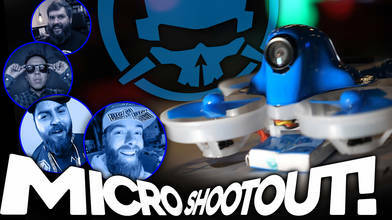 Taking the most popular micro brushless drones and comparing them for their racing, freestyle and durability capabilities. Out of the Beta65 Pro, Mobula7, EMAX Tiny Hawk, and Tiny Whoop which do you think won the battle of best micro brushless drone? Watch the video to find out.